We all remember when Disney/Pixar’s “Finding Nemo” was released in 2003 and Nemo the Clownfish (Amphiprion ocellaris) was a big hit for many kids and adults as well. As a result sales of clownfish in small aquariums increased dramatically across the country, which brought some concern with animal welfare groups. 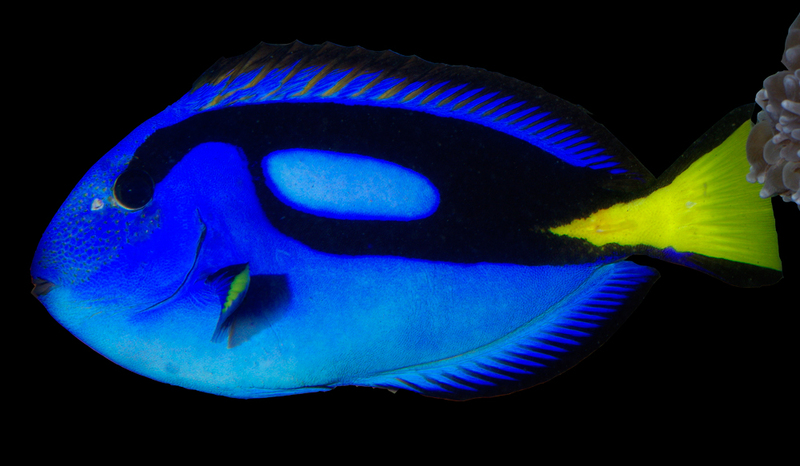 Now with the release of the new film “Finding Dory” we expect another increase in demand for the Pacific Blue Tang – Paracanthurus hepatus, also commonly know as the Regal Tang, Hippo Tang, Palette Tang/Surgeonfish and now Dory. Unfortunately (unlike Nemo/Clownfish) Blue Tangs are all wild caught, are more difficult to keep, prone to skin diseases and can grow up to 26cm. That being said they can be kept quite happily if provided with proper care and good water quality. Its our duty to educate our customers and make sure that they are aware of the facts and care of keeping these beautiful fish. Blue Tangs Paracanthurus hepatus are found widespread in the Indo-West Pacific waters around coastal to outer reefs living at depths of around 2-40 metres, where juveniles feed on zooplankton and introduce a benthic algal diet as they grow. They belong to the Acanthuridae family (Surgeonfishes), and as with all Surgeonfish and Tangs they share a common characteristic that they have one or more very sharp spines or “scalpels” on each side of their caudal peduncle (the area where the tail joins the rest of the body). These spines are used defensively or for protection from either intruders or quarreling with each other specially for territory. Care should be taken when handling these animals. Blue Regal Tangs are not typically aggressive and live quite peacefully with other tank mates, they can be kept in groups but only in large sized aquariums (800L min) with plenty of swimming room and rock work retreat décor. Typically Blue Tangs are algal grazers, but they should be also offered meaty enriched foods, like krill, mysis shrimp, and mussels. Its very important that they are offered plenty of marine based seaweeds and algae foods which will strengthen their immune system, reduce aggression and improve health. Sea Veggies, Spirulina, Vitalis Aquatic Nutrition, and Ocean Nutrition – pellets, flakes and grazing rings are all ideal products and are very easy to use. Vitmain supplements are also a good idea and we recconmend Brightwell Aquatics – Vitamarin and Amino liquids. So in summary Blue Tangs make a great addition to most reef and community based marine aquariums, colourful, show full, and also great for controlling algae. They need plenty of swimming space and should have access to retreats like rocks, coral and caves. They rarely pick on corals, invertebrates and other tank mates, but sometimes will quarrel with each other. Water conditions should be kept between 22-25°C, dKH 8-12, and a specific salt gravity levels of 1.020-1.025. They are prone to Ich (marine white spot Cryptocaryon irritans), and other skin infections like lateral line and fin erosion. But if well looked after and fed a varied nutritional diet, they can happily grow to 26 cm and live up to 20 years in captivity. Currently all the fish we sell are from highly monitored suppliers where collection, handing, and shipping regimes are in place and key species are only temporarily available at any given time. Its our duty to educate the public and customers about keeping exotic animals and why it is vital to keep hobby strong and alive. All our shop staff are well experienced hobbyists and if you need more advice please feel free to speak to us. We have many aquariums on display and also supply custom size aquarium builds. All available fish for sale are wild caught (at the time of writing). Although the IUCN currently lists the species as ‘Least Concern’ it doesn’t mean to drop our concerns, there is still is not enough world data to conclude that wild numbers are stable or declining. There is a strong ongoing breeding program in Taiwan with some successful spawning but rearing fry as been a real challenge. Rudie H Kuiter/Helmut Debelius,2001, Surgeonfishfishes, Rabbitfishes and their relatives: A comprehensive Guide to Acanthuroidei, 2001: 69-71.